The Nigerian Diplomat - The most reliable platform for presenting the best of Nigeria – positive diplomacy and foreign relations news; diplomatic strategy; international development jobs; policy review; value inspired role models; good music, humour, art and culture; history, etc. The Bangladesh High Commission in Abuja, Nigeria has participated in the Kaduna International Trade Fair—organized by the Kaduna Chamber of Commerce, Industry, Mines and Agriculture—for the first time. The event took place between March 29 and April 7, 2019. Dr. Okechukwu Enyinna Enelama, minister for Industry, Trade and Investments of Nigeria, inaugurated the fair on March 29, 2019. Md Shameem Ahsan, Bangladesh high commissioner to Nigeria was present—along with diplomats from other countries, local dignitaries, and the business leaders—at the inaugural ceremony which marked the 40th yearly event. In line with the present government’s emphasis on “economic diplomacy,” Bangladesh’s mission put up a large stall with its own collection of exportables. Bangladesh’s stall received the Best Foreign Participant Award, and a crest was handed over, ceremonially, on the concluding day, by Mr. Abidul Yazid, patron of the trade fair. Pharmaceuticals, ceramics, jute and leather products, RMG and knitwear, tea, jute leaf tea, electrical appliances, light engineering, plastic and melamine products, spice & curry powder, pickles, food items, snacks, pearl items, saris (muslin, silk), nakshi kantha, handicrafts, among others, were on display; these drew huge crowds each day. The High Commission is in the process of launching a commercial display centre at the chancery soon, to showcase exportables to the visitors and Nigeria’s potential importers and investors. Zainab Shamsuna Ahmed, the finance minister of Nigeria, was on March 21 , appointed by the Africa Union (AU) in Addis Ababa, Ethiopia, as the chairperson of the Board of Trustees (BoT) of its peace fund. This Day reports that the board is made of five members drawn from each region of the continent. The board also has non-African members (United Nations and European Union) as international partners. According to the report, the finance minister represents the Western African sub-region on the board. The report quoted a statement by the special adviser to the minister on media and communications, Paul Ella Abechi, as saying Ahmed expressed appreciation and commitment towards achieving the agenda of the special fund. Accordingly, it was learnt that the protocol relating to the African Union Peace and Security Council (PSC) provides for the establishment of a special fund to be known as the “peace fund”. This fund comes with the objective of providing the necessary financial resources for peace support missions and other operational activities related to it in Africa. According to the report, the peace fund is meant for the prevention and management of conflicts, and the promotion of peace in Africa. It also said the board of trustees was established by the assembly of the union in July 2016, to ensure strategic coherence, enhanced governance, financial and administrative oversight of the peace fund. On 5 March 2019, Abdullateef Olasubomi Abdul, a young Nigerian lawyer, was appointed as the National Representative for Nigeria by the International Bar Association (IBA). This follows his recent appointment as Chair of the Regional Development Subcommittee of the IBA’s International Sales Committee for a two year term from 1 January 2019 to 31 December 2020. The position of a National Representative is established by the IBA Young Lawyers’ Committee (YLC) in order to promote the interests of young IBA members within the jurisdiction of each National Representative. As the National Representative for Nigeria, Abdullateef’s role includes fostering links between the IBA, young Nigerian lawyers, and the Nigerian Bar Association. As the Chair of the Regional Development Subcommittee, his functions include keeping the International Sales Committee apprised of developments in the subcommittee’s area, recruiting IBA members to assist in the subcommittee’s works, and assisting with any relevant sessions of the International Sales Committee. “I hope to employ these roles to deepen my contributions to the legal profession and to young and aspiring lawyers in Nigeria and globally. 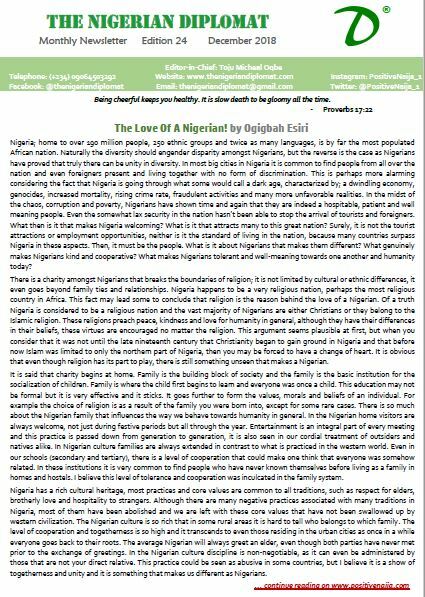 I also hope to add depth to the Nigerian narrative. Abdullateef is an Associate in Ikeyi Shittu & Co, a full service Nigerian law firm. He is also an Associate Fellow of the Society for Advanced Legal Studies (SALS), London. A multi award-winning lawyer and writer, he was recently named as the 3rd most influential young Nigerian in Law & Governance and the 21st most influential young Nigerian overall for the year 2018. The National Bureau of Statistics (NBS) said Nigeria recorded a total trade value of ₦32.26 trillion year-on-year in 2018, representing 39.3 percent increase over the corresponding period in 2017. The trade value for 2017 stood at ₦23.16 trillion. The NBS said this in its Foreign Trade in Goods Statistics for Fourth Quarter of 2018 posted on its website. The bureau said the volume of total merchandise trade in 2018 was the highest recorded since 2014, nearly double pre-recession levels. It said during the fourth quarter of 2018, total merchandise trade stood at ₦8.60 trillion compared to its value of ₦9.06 trillion recorded in third quarter of the year. It said the total export component of the trade recorded at ₦5.02 trillion, represented an increase of 3.5 percent over third quarter 2018 and 28.5 percent over fourth quarter 2017. Meanwhile the bureau said the import component stood at ₦3.58 trillion in fourth quarters 2018. The figure showed a drop of ₦631.6 billion or 15.0 percent compared to third quarter, 2018 but an increase of 69.6 percent when compared with the corresponding quarter in 2017. However, it said the increase in export value and decrease in import value (relative to third quarter 2018) resulted in a favourable trade balance of ₦1441 billion, or 125.5 percent over the preceding quarter. According to the report, crude oil export has been the main stay of the economy; it accounted for the largest share of total exports (84.2 percent) in the fourth quarter of 2018 at ₦4.228 billion. Non-oil products accounted for 4.6 percent of total exports while other oil products accounted for 11.2 per cent of total exports in the quarter under review. The report said that the value of crude oil exports in the fourth quarter, 2018 was 1.98 percent higher than in third quarter 2018 and 29.95 percent higher than in fourth quarter 2017. It said the value of other oil products exports increased by 3.5 percent in fourth quarter 2018 when compared with third quarter 2018 and 15.99 percent compared to fourth quarter 2017. Also, the value of manufactured goods exports rose by 14.97 percent in fourth quarter 2018 when compared with the value recorded in third quarter 2018 but decreased 36.6 percent against the corresponding quarter in 2017. It, however, said that the exports of energy goods increased in value by 6.1 percent in fourth quarter 2018 compared to third quarter 2018 and by 12.7 percent when compared with fourth quarter 2017. Meanwhile, the bureau said the value of total exports in fourth quarter 2018 increased by 3.52 percent against the level recorded in third quarter 2018 and 28.46 percent higher than its value in fourth quarter 2017. India, Spain, France, South Africa and the Netherlands were the country’s major export trading partners in the quarter under review while China, US, Netherlands, India and Belgium were the major import trading partners. Nigeria’s ambassador to the United Nations, Tijjani Bande has assumed the chairmanship of the African Group at the International Organization for the Month of March 2019, succeeding the Republic of Benin. Professor Tijjani Bande took over from Jean-Claude Do Rego, the Permanent Representative of the Republic of Benin to the UN at a ceremony at the African Union Observer Mission in New York. He also said that he would be chairman of the African Group and would like to send the views of the African Union to the United Nations and globally. “The focus of the mission of Nigeria is to continue the work of consolidating Africa’s position on the continent. These positions are issues like Security Council reform, positions we take in relation to the status of women, and issues relating to peace and security around the globe. The whole idea is to strengthen the African voice. The Nigerian Ministry of Foreign Affairs says Nigeria and Federation of Russia have signed a treaty on Mutual Legal Assistance in Criminal Matters. The ministry explained through a statement made available by the Ministry’s Spokesperson George Edokpa, that the Treaty was negotiated in 2009 to enhance collaboration and cooperation between the two countries in the administration of criminal justice and signed in Moscow, Russia on Nov. 27, 2018. “The Treaty was signed on behalf of Nigeria by the Attorney-General of the Federation and Minister of Justice, Abubakar Malami, while Russian Acting Minister of Justice, Mr Oleg Plokhoy, signed on behalf of his country. The Treaty on Legal Assistance in Criminal Matter is aimed at providing the necessary mechanism for cooperation in the fight against crime and criminal related matters. The ministry explained that the agreement would assist in the fight against corruption as it makes provision for the tracing, recovery, forfeiture or confiscation of stolen assets, as well as the proceeds and instruments of crime. The signing of the Treaty, it stated was a major breakthrough in the bilateral relations between Nigeria and Russia and the beginning of greater cooperation and partnership in other sectors. The United Nations General Assembly on Monday adopted, by consensus, Nigeria’s resolution to proclaim January 24 every year as the ‘International Day of Education’. The News Agency of Nigeria (NAN) reports that all the 193-Member States of the UN General Assembly supported the Nigerian resolution, hence, there was no dissenting voice or abstention. Nigeria Immigration Service (NIS) has declared that it recorded a total of 81,003 foreign nationals resident in the country, of which those from India and China, Britain, the United States and Lebanon top. The Comptroller General of Immigration Service, Muhammad Babandede, in a statement, Friday, signed by the Service’s Public Relations Officer, deputy comptroller of Immigration (DCI), Mr. Sunday James, said the disclosure is in line with agency’s ‘statutory mandate as enshrined in Section 2 (a) – (f) of the Immigration Act 2015 as amended,’ even as he assured that it will now provide a quarterly report of migrants resident in Nigeria. The NIS also said data was obtained from the newly-introduced Visas on Arrival (VoAs) regime as well as the Temporary Work Permits (TWPs) issued from various international airports in the country. “As at August 31st 2018, the Nigeria Immigration Service has recorded a total of 81,003 non-ECOWAS foreign Nationals legally resident in Nigeria. From available statistics, there were 2,694 United States citizens, 3,946 Britons, 17,995 Chinese, 31,660 Indians, 6,295 Lebanese and 1,295 Germans living legally in Nigeria. Also, there were 17,118 foreign nationals from 92 other countries resident in the country. Within the same period, 82,084 Visas on Arrival (VoAs) were issued at 6 International Airports in Nigeria and a total of 7,570 Temporary Work Permits (TWPs) were also issued by the Service. The breakdown for the TWP is 1,492 issued to Indians, 1171 issued to Chinese, 987 issued to Britons, 1006 issued to South Africans, 641 issued to Italians, 649 issued to Ukrainians while a total of 1,624 were issued to other nationals.